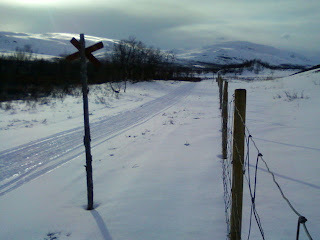 Along the south east edge of the site, there is a trail that runs along the reindeer fence. This is marked with red-crossed-posts to show the way. There is not much traffic along this path, which runs from Finland to Norway, but there were still a few lines in the snow. The snow-mobile trail that runs past the KAIRA site. Note that although the fence is metal, it is nearly 10 metres below the level of the HBA tiles, thus well out of the way and not a problem in terms of reflections into the system.